The City of Decatur Police Department is committed to making a positive difference in the lives of our citizens through professionally supported and trained police offers. Officers strive to provide an environment that will allow citizens to live and work in a safe and secure community. If you need the assistance of an officer and it is a non-emergency situation, please call 479-752-3911. 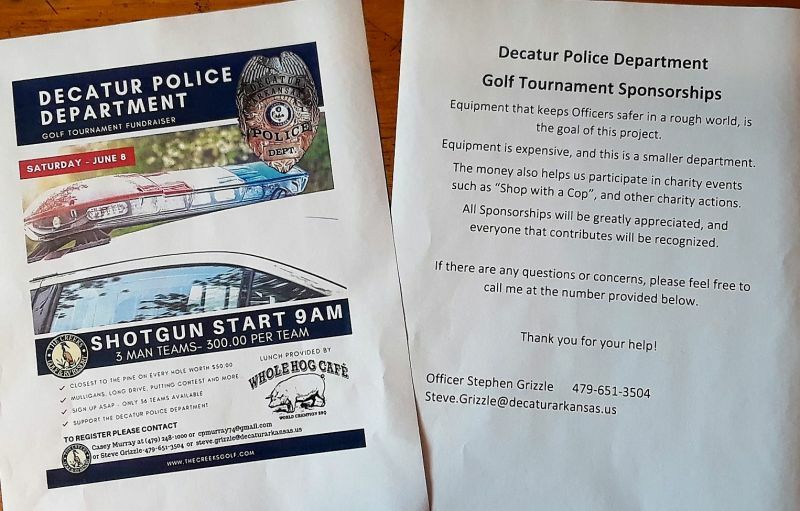 If you, individually, or your company, if you are a business owner, would like to help sponsor this event, or want to just make a donation please contact Officer Steve Grizzle or mail your contribution into the City offices attention Steve Grizzle at PO Box 247, Decatur, AR 72722. Please be sure to include all contact information so that we can get a receipt back to you.